It’s been a while since I posted some home cooked food. Don’t get me wrong, it’s not that I haven’t been cooking (I still cook maybe four times a week), it’s just that I’ve had a lot of restaurant posts to catch up with. 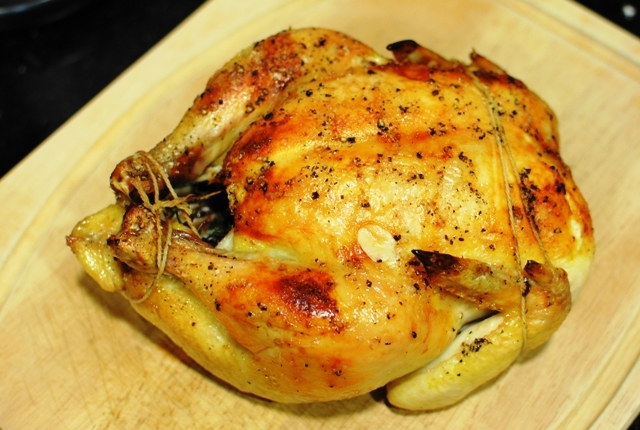 Anyway, this past weekend, I felt like roasting a chicken for some reason. I think part of it was the cold winter weather, and part of it was my ongoing effort to develop and perfect a recipe that I like. Everyone seems to have their own roasted chicken recipe. I consulted a number of recipes including Cook’s Illustrated, Thomas Keller and Ludovic Lefebvre. I kind of just combined certain characteristics from all three of them into mine. I started a few days in advance by starting my brine. I find that brining a chicken, while a little time-consuming, really pays off by ensuring a juicy result. Always looking for ways to add flavor, I added fresh thyme and rosemary, as well as garlic and a bay leaf to the salt and sugar brine. 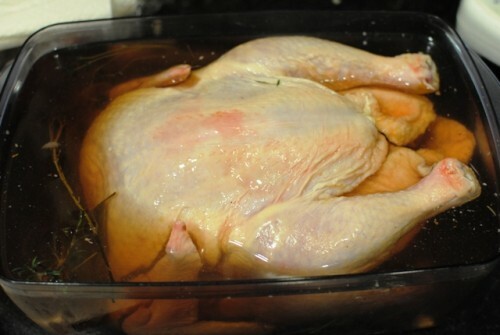 I let the chicken sit in this brine overnight, then rinsed well, patted dry, and let sit in my refrigerator for another day to dry the skin even more. This is something I especially like to do with steaks, as it ensures the exterior is completely dry to maximize browning. Finally, I was ready to start cooking. I removed the wishbone with a paring knife (another step that’s more work upfront, but paid dividends later), which would help carving and the presentation once cooked. I stuffed the cavity with garlic, thyme, rosemary, salt and pepper. I also put a ton of soft butter on the top, something I took from Ludo’s recipe. I was ready to put the chicken in the oven – I had an onion on-hand, so I figured I’d roast them as well. In the end, they didnt really add anything. 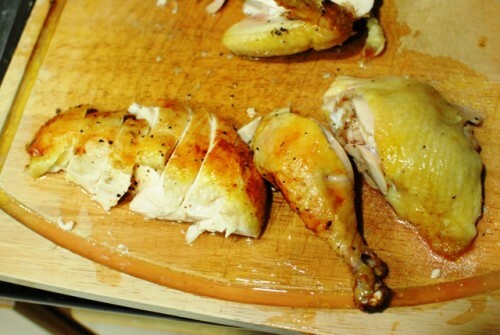 I roasted at 450 degrees until the drumstick/thigh reached 160 degrees (about 50 minutes) and let it rest. The browning wasn’t quite as even as I would’ve liked; I’m not sure if this was just the oven or me. While letting the chicken rest, I finished some fingerling potatoes that I had parboiled earlier. 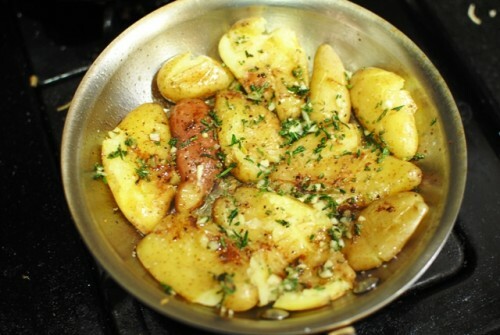 I sauteed them in a skillet, crushing them slightly, with salt, pepper and fresh rosemary. The resulting chicken was pretty moist and flavorful and I was happy about it. While the browning wasn’t perfect, the skin was still pretty crispy. I ended up smashing the potatoes a little more than I should have, but it still tasted good. I’m still debating what to do with the chicken stock I just made from the resulting bones. What happened to the onions in the end? They didn’t really caramelize well…and just didn’t add anything to the party. NICE!! 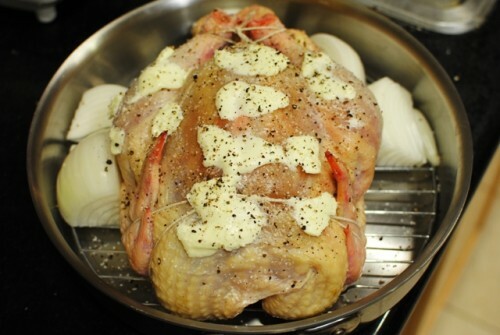 Glad you took Ludo’s butter suggestion 🙂 Cooking the potatoes with the chicken is really the best way if you ask me, but what do I know, I am only the wife. Thanks Krissy! 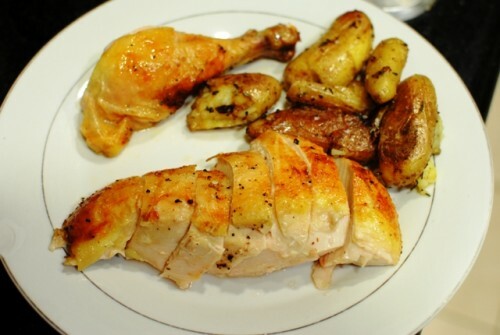 I’ll try cooking the potatoes with the chicken next time. You should know…because you eat the food!